I recently noticed that my son’s sneakers were getting hard to put on him, which makes sense since he’s a growing little boy. I figured I’d just head to the mall and replace his sneakers. No big deal right? When I got to the mall to pick up a pair of shoes for him, I was shocked. The prices seemed so high to me, and despite having a six-figure income, I refused to buy them. Now, I’ll give you this; the little tiny Nike shoes with the swoosh were very cute. However, they were on sale for $49. To be honest, I wouldn’t call myself cheap by any stretch of the imagination because I do enjoy nice things. However, while I am in the middle of repaying my husband’s student loan debt, I can’t fathom spending that amount on my two-year-old when he’s going to grow out of the shoes in just a little while. It wasn’t just one store either. I went to store after store with the same results. I couldn’t believe that shoes for a toddler cost the same amount as my shoes, even though they were much, much smaller. I tried some of the stores that are known for their great prices, like Payless, which had sneakers for around $20. Although I almost bought them since they were the lowest price around, I decided to try Walmart before committing. It was there at Walmart that I found $3 sneakers for my son on sale. This experience only strengthened my desire to find ways to save on kids clothes. When kids are too young to remember what brands they wear (or care) it just seems almost irresponsible to me to pay full price for brand name shoes and clothes that they are going to grow out of in a relatively short period of time. Some people might argue that they’d rather buy shoes that last longer, and maybe the name brand shoes do. I really wouldn’t know since as evidenced above, I haven’t bought a pair of high end shoes for either of my kids thus far. I have noticed that Walmart clothes don’t hold up very well but so far the sneakers I got him are doing great. Sure, the Walmart sneakers didn’t have name brand checks on them, but they are your basic gray sneakers nonetheless. What more does a two-year-old need? The shoes even have a orange stripe on them, which my son proudly points to and yells, “Orange!” They work perfectly for him and for the park and the mud and help fulfill my son’s need to run around and get all his energy out. What’s More Important: Shoes or College? I tell you this story and have such strong feelings about toddler shoes for a reason. This is not just simply a rant. I want to bring it up because I feel as though many parents are missing what’s important when it comes to spending on their children. Every day, companies market to us as parents trying to get us to open our wallets to give our children the biggest or the best items available. When is it too much, though? Where do we draw the line? Do the clothes and shoes they wear really make a difference in the long run? Does it make them better people, more polite, or more well-liked? Don’t forget that we are facing a huge student loan debt crisis in our country. By last count, Americans are living with more than $1.3 trillion of student loan debt. These numbers have not really convinced parents to aggressively save for college, as many of them are still paying back their own loans. Yet even though so many parents say they don’t have extra money to put towards their kids college education, they somehow have the money to put their kids in name brand shoes. I know that technically, parents are not choosing to put their kids’ shoes over saving for their children’s college education, but maybe it does make a difference. Maybe if we all stopped getting caught up in trends, we could focus more on saving for their educations. I know many people are simply trying to give their children a better life than they had and sometimes that means splurging for the $40 Nike sneakers instead of going to Walmart. For me though I’d rather my kids wear knock off shoes while they don’t know the difference and keep adding to their savings accounts instead. How are you saving for your children’s college education? Do you buy your children high end clothes? Why or why not? Help me understand why some parents might go this route. We go back and forth on this. 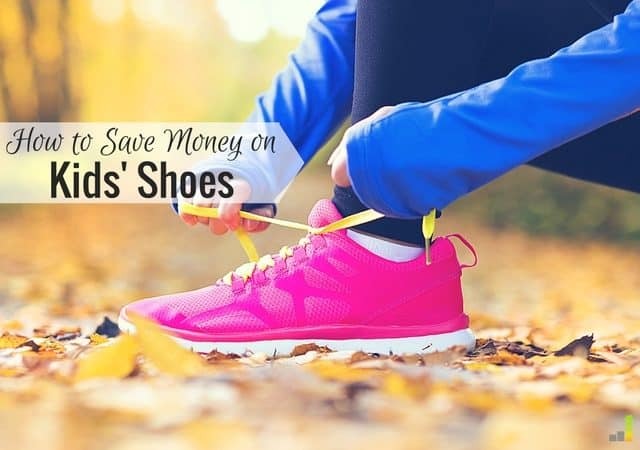 The expensive shoes do seem to last a lot longer, I think just about every pair we’ve had has still been wearable until the child outgrows them, where cheaper pairs have saved money up front but have often developed ripped seams or holes on the top or on the sole that shorten the life. You can often find the expensive shoes on sale. We sometimes shop at Stride Rite outlet stores, and they’ll often have Buy One, get one Half Off, which still isn’t cheap, but with two kids, it works out well and takes a little of the sting out. Yep I’ve heard good thing about Stride Rite – they might have to be a candidate when their feet stop growing so fast! I’ve just invested 105 Euro for winter shoes for my two children. My children wear second hand clothes, have second hand furniture, second hand toys, but they get good shoes. This is the only pair of shoes they will wear the whole winter. I don’t buy them shoes to match outfits, just plain healthy shoes. No sparkle for the girl, no construction machines for the boy, just 2 very good fitting shoes. Mmm yes when it’s time to buy the winter boots I head to a local consignment store. Definitely have to protect those cute little feet in the snow! Had a similar issue with my son’s shoes. His feet are growing like crazy and I needed to pick up some new shoes for him. I got some around $30, but like you said that seemed high. I searched online and found some nice shoes for around $15. I ordered those and returned the other ones next time I went to the mall. Crazy! We can learn a lot from kids. They are content with the basics and can find joy in the simplest of things. Totally agree. They definitely don’t care about name brands! I’m so with you on this one! My son is one and his feet grow like every other week. I go to Walmart and find the cutest pair of shoes, buy two sizes and go to check out. I refuse to waste money on shoes he’s going to wear for like three days! lol! Seriously, their feet grow so fast! Agreed. 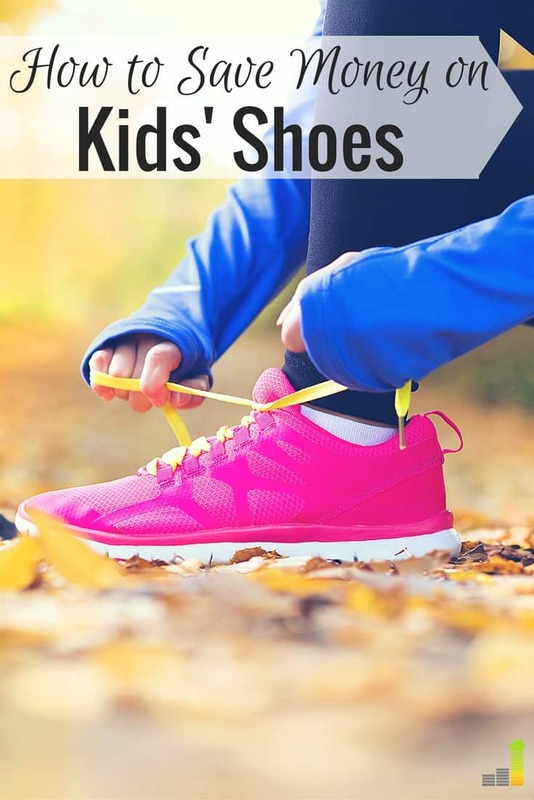 When they are that young, they’ll be outgrowing the shoes quickly – usually before they wear out. BUT, when he starts grade school, the better name brands do last longer. One year my son decided to try FILA shoes (cheaper name brand). They broke down w/in 2 months. I replaced them w/ some on-sale Nikes which lasted the rest of the school year. Ah well longevity is important. I hear I get to buy less shoes when they get a bit older and start moving up one size a year or so! Does low price always mean low quality? What studies have you read or how do you determine if shoes are “crappy flat shoes”? Very true!! I have the worst feet problems now. Painful flat feet. I’m convinced it’s because my mom always bought me the cheapest shoes possible growing up. Shoes aren’t something I want to cheap out on. I definitely buy used clothes for my son since he grows so quickly out of them. I am torn with shoes though. I have feet and knee problems which stem from my parents buying terrible shoes for me growing up. I think I will probably buy higher quality name brand shoes so that my son may avoid some of the problems I had. So while he might not be fashionable he will have quality shoes to wear. Yeah I think it’s just hard to figure out where the low quality shoes are. Does low price always mean low quality? Thankfully, my son can wear Crocs (or off brand Crocs) 9-10 months of the year, so we really only need sneakers or boots to last a few weeks. Shoe Carnival has great sales every other month, so we’ll be hitting that up to get Kenny some sneakers for the fall. Sounds great. My kids have a few pair of hand me down Crocs too! When kids are so young, their shoe sizes change so quickly! It’s true that more pricier brands tend to have better quality, but you can definitely find some cheaper brands that have just the same quality as those bigger, well-known brands! There’s no point in spending a fortune on kids’ shoes if they are going to grow out of them quickly. I read an article about how Italians don’t cheap out on shoes; even the poor buy good quality. They say having proper shoes affects their bodies later in life or something. Similar to what an above comment said. I buy Italian brands (geox, naturino) for my son online when I can find a good sale, and they’re usually the same price as a stride rite shoe. I definitely see a difference in quality. I use to buy shoes at walmart. I figured the same as many people think, “he wont be wearing them long so they can last.” In no time he would tear a hole in them or the shoes would “talk” (sole separate from shoe.) SO I have decided to buy the more expensive sneakers/boots. I have never had a problem with any shoes breaking since I made that decision. By the time I have to buy multiple pairs I could have bought one good pair equaling the same money in the end and waste less time. I check consignments and I still buy cheap dress shoes since he doesn’t wear them daily. For a two-year-old boy, it’s definitely a good solution, but for twelve-year-old, I don’t think this is a very good idea. I’m about 100% sure that his popularity in the class will decrease. Teenagers need to have this “title” (brand) to wear.